Lake Worth is the waiting room for a passage to the Bahamas. It’s well-protected, although it gets rolly in very strong southerlies (which we’ve had); and is only about two miles from the Lake Worth/West Palm Beach Inlet. 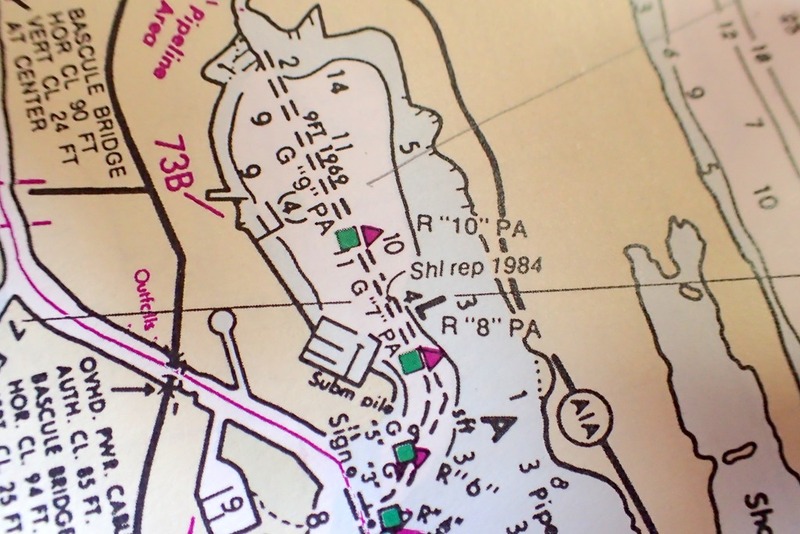 We spent about a week north of red triangle “10,” between “5” and “11” on the chart. 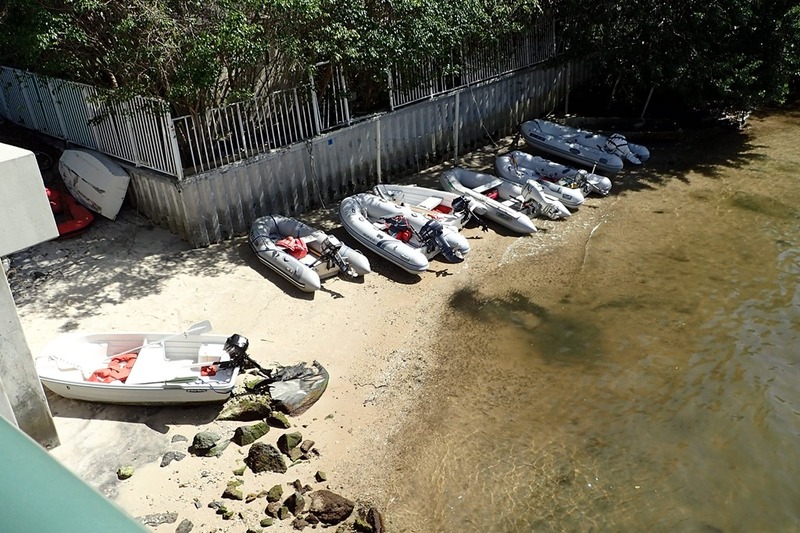 Boaters generally anchor in the northeast corner of the lake because the municipality of North Palm Beach passed an ordinance imposing a fee for anchoring within their territory, which apparently encompasses the southeastern half. Although it’s surrounded by homes, condos, and other visual atrocities, it has its charms. Lovely sunsets, for one. And some conveniences. At the north end, a low bridge divides Lake Worth from Little Lake Worth. The sandy beach at the bottom of the bridge is a dinghy landing. From there, the Publix is only a few blocks and we even picked up an amazon.com package (a new bilge pump) at Shipping Plus, a few blocks further. 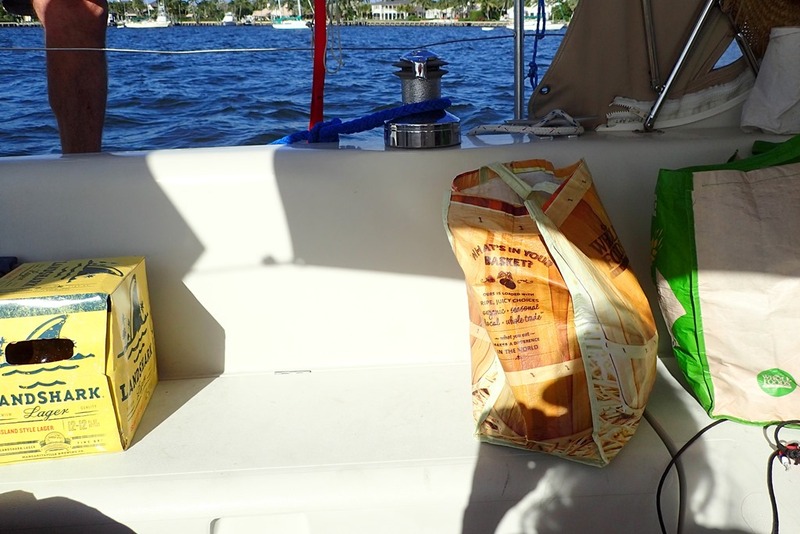 Bringing the groceries back to the boat with a brisk south wind required garbage bag protection, but they stayed dry. We, on the other hand, got soaked. Note the Landshark beer. A special treat made possible by a small roller cart and the close proximity of the Publix, i.e., we didn’t have to actually carry the groceries. Great eats since this shopping excursion – a very upscale Publix, (duh, it’s North Palm Beach). 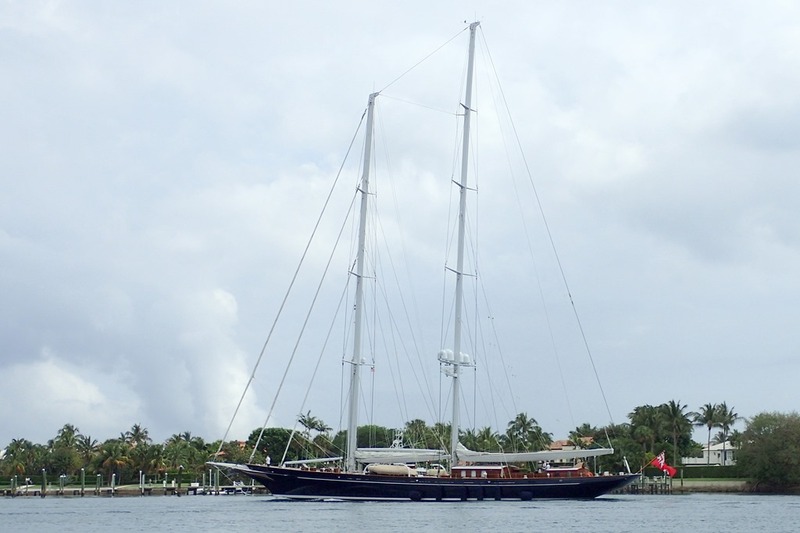 Many fine yachts, super yachts and mega-yachts. Just south of us and on the north side of the Inlet is Peanut Island. This small island was created by dredgings from the Inlet and the Intercoastal Waterway. Started in about 1920, it’s grown to almost 80 acres. It’s shaped a bit like a peanut, but supposedly got its name because of a failed peanut oil-shipping scheme. Now the perimeter is a park which includes a fake reef you can snorkel. You can also tour the Cold War bomb shelter built for JFK after his election; he liked Palm Beach in the winter. 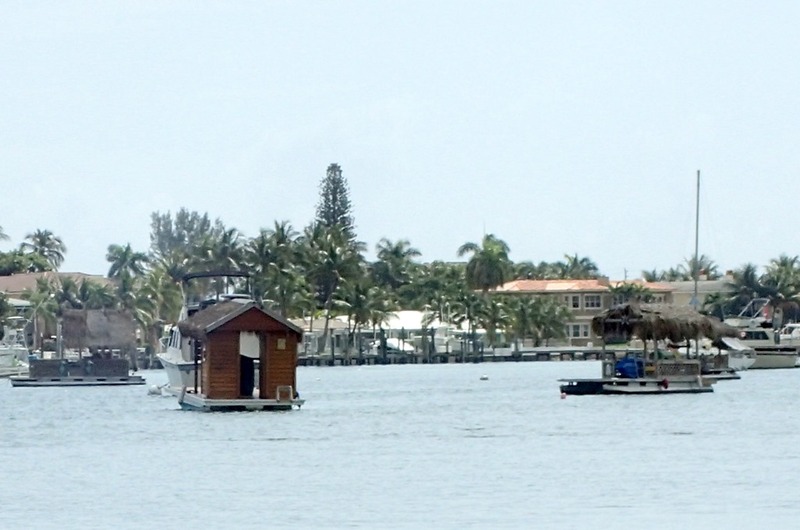 These tiki rafts – one of them is half-sunken – suggest the party times that Peanut Island encourages. We are decided at a marina stay for a few days. Three main reasons: (1) bad cabin fever – all the waiting, due to the unhelpfully non-cooperative weather for our passage to the Bahamas; (2) one missing amenity – a laundromat; and, (3) being tied to a dock will facilitate a trip back to DC for some needed medical attention for Nancy’s TMJ. 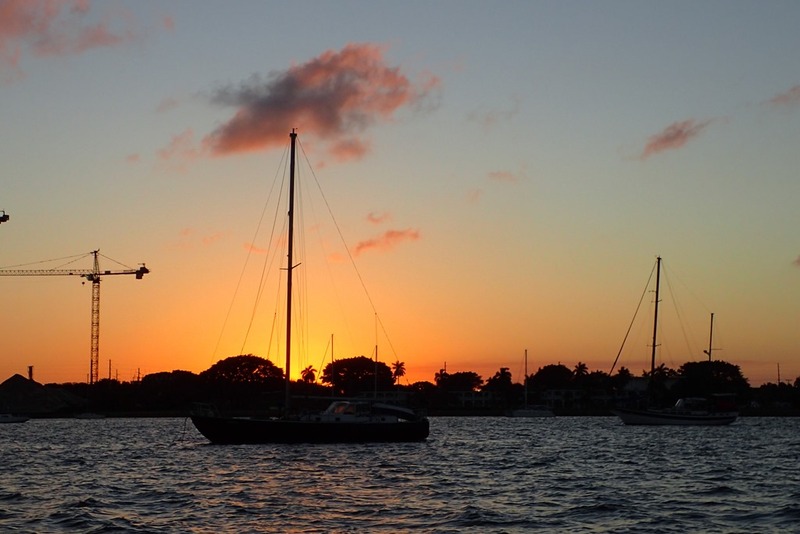 We selected Old Port Cove marina, right across Lake Worth from where we’ve been anchored. It’s an appropriately upscale marina: spa-quality bathroom/showers; very clean laundromat; air-conditioned lounge; nice restaurant (a bit snooty); great docks and well protected; and a complimentary bottle of wine upon arrival! And we are sincerely trying to overcome our weather addiction. Maybe we need a multiple step process, but so far we have pledged to check the weather only four times every 24 hours and not discuss it ad nauseam. Instead of being continually obsessed with it. 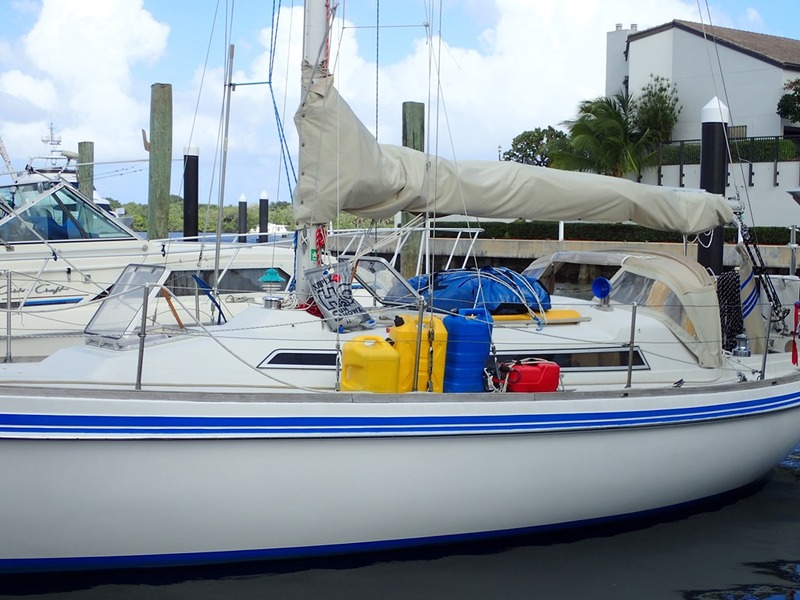 No question, we are ready to go – see the dinghy all deflated and wrapped up on deck – but nothing yet. We passed on a 16 hour window last Friday; a friend of a friend left and got caught in gusts to 40 kts at Great Sale. Yikes! Meanwhile, it’s been beautiful here, notwithstanding a bit of rain. Warm and mostly sunny! I am glad you are sticking to your weather minimums. We have an old saying: “I would much rather be down here wishing I were up there, than up there wishing I were down here”. Be safe and enjoy.